I’m less upset over the field goal, and more concerned with the lack of touchbacks. It looked like earlier in the game, Henery was employing that “mortar” kickoff, where he gets good hang time, lands the ball between the 5-10 yard line, with the returner usually getting dropped somewhere between the 25-35 yard line. On the final kickoff, it appeared that Henery tried to blast it for a touchback, only to end up booting a line drive fielded right at the goal line by Sproles. Colt Anderson came out afterwards and admitted he lost contain, but that kickoff was brutal. The sad thing is, despite a Cary Williams taking a smart penalty with the touchdown saving horsecollar on Sproles, the hindsight smart play would have been to let him to go, knowing that with the penalty, NO was set to begin in Eagles territory anyway. In that case, we would have gotten the ball back needing a touchdown with 4 minutes to play. Yep, definitely better to let them score in that scenario. 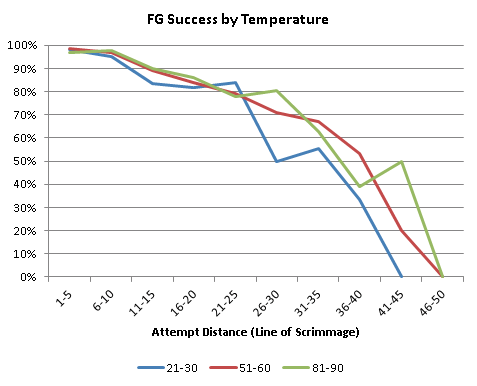 Touchbacks are a problem, and a big reason why I think the team will look to other kickers. Again, it was in really cold weather, which makes it harder, but that’s been a weakness of his for a while. I would be happy looking at a kickoff specialist- many teams use them. Heck the Saints use one! But people consistently rag on Henery about consistency on FGs, and that I don’t get. He’s been pretty accurate (he missed a 60 yard FG only on accuracy, the length was fine)- before that miss he made 9 straight, with 3 of the last 4 coming over 47 yards. Brent you got it all wrong with Henery. Every other kicker in the NFL is 100% from 48 yards in 25 degree weather and everybody could predict that Henery would miss it because he is the worst kicker ever. Colt Anderson didn’t say he just lost contain, he purposely tried something different to clog up the middle b/c that is where they had been running. I’m not saying the loss is on Colt, but why is it all on Henery? The Eagles and GB game made me think that once a team is in FG range (say 44 yarder) and have a first down and about 2 minutes left (assuming not enough timeouts to do anything but stall the game), the D maybe shouldn’t call timeouts and just let the play clock run. I know you get 2 chances at a fumble, but much more likely seems to be giving up another 8 yards and making a FG try move into a much more comfortable range. This happened in the GB game – bad weather etc., GB stopped clock so SF just gained more yards. Its an interesting point. I’ll have to think that through. In certain areas, it definitely makes sense to have an extra 5-10 yards on the kick than to get the ball back with very little time left. Brent, we are talking about not getting the ball back at all. The difference to me is make them run 2 more plays (I know Chip would think that’s 2 more times for the O to make a mistake), but the downside is they get 2 more plays. The 49ers got a much more comfortable FG I thought by getting another 7-8 yards on plays the D forced the O to make. Do you think Foles has a ceiling like Dalton, Schaub, Alex Smith b/c he does not have a live enough arm? Ancillary, b/c of that does he not take enough chances? It’s almost like too few interceptions can be read as a negative – that the QB is too conservative and hiding an inability to “win” games. I hear you on the TOs. If you’re not going to get the ball back anyway, then it’s probably a mistake to extend the game (fumble rates are extremely low in those situations.) Plus, you might mess with the other team’s heads a bit since everyone expects the TOs. With Foles, I think he has a higher ceiling than all of those guys. Doesn’t mean he’ll get there though. There is something to the “not taking enough chances” storyline, but I chalk a lot of that up to him being so young. I’d much rather have a QB start out risk-averse like Foles, then gradually take more chances once he has a better feel for the game, as opposed to starting out more risky. Also, it’s not like he’s checking the ball down every time. I believe he led the league in % of deep throws this year.